The Push Poppers aroma is not new, but it is one of the most popular Poppers aromas. It’s a room odorizer with a very strong effect. Push Room Incense has been new developed with a new formula and now much stronger. It is gently, clean and … strong… stronger… PUSH! Just use according to manufacturer’s instructions. 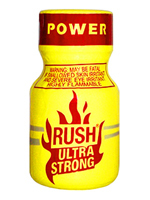 The Rush Poppers was the first Poppers brand. Since PWD launched Rush on the market, it was sold over 10 million times. Over 25.000 bottles per day. This make it to the favorite brand and the number 1 selling brand of Poppers in the world. Rush Poppers have a nice smell and is a pure and clean product with a strong effect. You can inhale it pure, with a inhaler or with the mask. Welcome to our Poppers summer specials. Now you’ll find in our shop (link above) a lot of hot special offers for your hot summer nights (and days 😉 ).